Belonging to The Secret Recipe Club means that once a month I get to read a whole lot of new blogs. Some of them then become regular places to visit and others I might not see again for a while. In May of 2012 I found a recipe for raspberry jam with ginger and chilli on Mangia and I printed the recipe off and left it on my fridge. 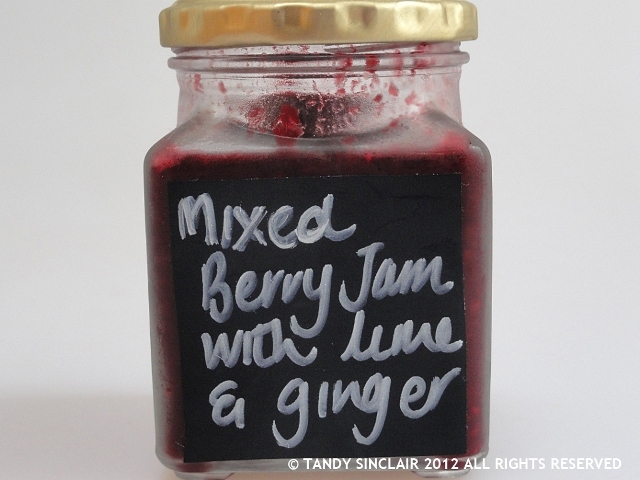 In my December holidays I worked through my pile of recipes in my to do ‘file’ and thisMixed Berry Jam With Ginger And Lime recipe was one of the first I made. I had bought frozen mixed berries to use for a photograph and decided to adapt this recipe and make the jam with them. I could not stop licking the spoon while making it. I like that it made one jar of jam as that means I get to enjoy this flavour and I can experiment with other flavours sooner rather than later. Love this jam recipe. Am amazed no sugar.. fantastic.. yesterday I made citrus marmalade as the shops are full of oranges and naartjies etc.. It really is delicious!! Looks and sounds like fantastic jam! I’m not a jam maker, save for apricot jam, but this sounds delicious. Love the ginger lime and honey in this Tandy. Its a nice thing to do tio make jam, its quite soothing and makes you feel like you are doing something good, doesn’t it? it is worth the drool! Gorgeous – and honey and ginger too! The lime and ginger sound like the perfect flavor additions to this wonderful jam! Ooh, this sounds fabulous! I love that it uses honey instead of sugar.